Nothing hurts your cash flow more than a vacant home. When you have no tenants, you have no income. Every vacant day hurts your bottom line. If you want to be a profitable homeowner, you need to decrease vacancy periods. There are a number of ways to avoid leasing delays and extended vacancies. At Real Property Management SAC-METRO, we understand the rental industry and know how to get you a better return on your investment property. We are committed to helping you place new tenants as quickly as possible to prevent lost revenue. Our Sacramento real estate management professionals offer a few suggestions to get your home ready to rent out. Potential tenants judge a home before they even step foot in it. A home with curb appeal naturally catches the attention of prospective tenants. When your home is attractive and the yard is clean, you can expect a larger amount of showings and applicants. When you receive more applications, you increase your odds of finding reliable tenants. Selecting qualified tenants for your home is the key to your profitability. It is worth your time, energy, and resources to invest in the outside look of your home. Begin with the yard. Cut the grass and remove weeds, fallen leaves, and dead plants. Trim any greenery or bushes that appear overgrown. Keep the grounds free of debris and clutter. Once the yard is in order, make improvements to the exterior of your home. A fresh coat of paint transforms a home. If painting the entire home is not in the budget, then consider just the front door. Better yet, replace the front door. This can drastically change the feel of your home. A clean, smooth look to the door produces an inviting entryway. Fixing up the interior of your home is the next way to get your property rent-ready. It is important to begin preparing your rental for new, incoming tenants the day your previous tenants move out. Walk through the home and evaluate what needs to be repaired or updated, then act quickly. Do not show a home while completing these necessary fixes. Prospective tenants need to be able to envision living there. This is difficult if the home is not clean and presentable at the time of their walk-through. When making home repairs or improvements, think long-term and make cost-effective decisions. Skimping upfront ends up costing you down the road due to more frequent maintenance and replacement expenses. When considering cosmetic improvements, you do not need an elaborate plan. The overall feel and look of a home can drastically change with a new coat of paint or different flooring. If the home is not in need of a total makeover, remodel the features of the home that will improve the overall ambiance of the home. From Roseville to Elk Grove, property management companies offer various services. Our Sacramento real estate management team follows the rental market and helps you decide the best rental price for your property. Too high of a price discourages applicants, yet too low of a price cuts into your profits. We have extensive experience managing homes in the greater Sacramento rental market and can help you keep up in this ever-fluctuating industry. 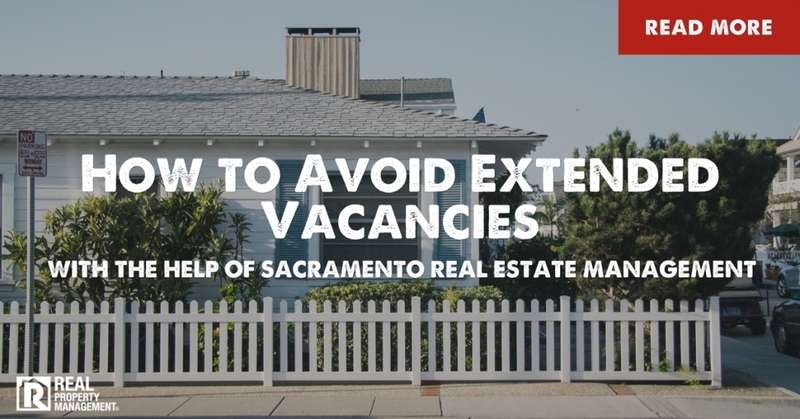 You will see longer vacancy periods if your home listing is not advertised properly. A simple yard sign is not enough. You will not find tenants quickly if tenants cannot find you in the first place. At Real Property Management SAC-METRO, we advertise your home across multiple popular websites. We also produce a video tour of your property allowing tenants to view your home online when it is convenient for them. Once we receive inquiries for live walkthroughs, we respond to those requests right away. Our experts understand the urgency to schedule showings promptly. Finding qualified tenants for your home is our top priority. We work nights and weekends to make ourselves available at times ideal for anyone interested in viewing your rental. Poor tenant qualification often leads to larger problems such as rent delays and increased vacancies. Investment property owners experience less tenant turnover when they take the time to place reliable tenants. Quality tenants tend to stay longer and better care for your home. A rigorous application process is an extremely crucial component of property management. At Real Property Management SAC-METRO, we ensure the best screening process possible. We verify income and employment. We check rental history and contact previous landlords to discuss any prior issues with the tenants. We look at credit and criminal backgrounds. We do this all while complying with any local and federal laws and regulations. We want you to be successful, and strive to find responsible tenants that will respect your property. You’ve worked hard to get your home rent-ready and find tenants; now it is time to get them moved in. The vacancy period is extended every day you do not have a lease contract prepared for tenants to sign. Waste no time getting the contract in order and gathering a deposit. It is vital your lease contract sets clear expectations and outlines specific tenant versus landlord duties. A well-written contract provides invaluable legal protection and security to you as a landlord. You can trust our Sacramento real estate management professionals to protect your property. We can help you decrease vacancies to increase your cash flow. Put our proven processes to the test. Contact Real Property Management SAC-METRO today.